The history of New England heavily centers on urban life, and more specifically, Boston. But, what about the history of its suburbs, which today form its bedroom communities? Most of those town histories are firmly grounded in, or at least laced with, farming. Any good story or study that depicts or explores the region’s past should consider New England’s agricultural heritage too. At the end of the nineteenth century, ‘haying season’ meant weeks (as many as six, starting around Independence Day) of rising at 4 o’clock, assembling a team of ‘mowers’ and farm boys, and laying down an acre of ground, all by hand scythe before 7 o’clock, while the dew was still fresh atop the grass. 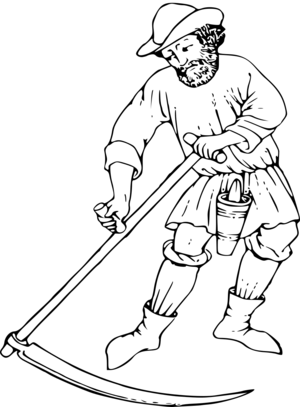 (For a period-incorrect illustration of a man using said scythe, see image at above.) Each day, the best mower of the team, the ‘boss’, cut the first swath into the field. This swath needed to be twice as wide as any other and was called a ‘doubler‘. The other mowers followed, each cutting swaths behind the doubler. Each then took a turn as the leader, while the prior leader was sent to the rear of the line. The etiquette of these men working the hay fields became quite formalized, and to break the etiquette was considered poor taste. Rivalries emerged among many of the men, and, occasionally, an overzealous mower would delight in closing the gap between his efforts and the effort of the man in front of him. Sometimes, he would approach so closely that he would ‘grass‘ the other man by throwing grass from his own scythe in front of the other mower. Some men got so engrossed in the rivalries that the sun and the labor overtook them, forcing them into the shade of a tree or bush. The mowers would taunt these men for becoming ‘bushed’. While the mowers toiled cutting swaths through the hay fields, farm boys followed in their wake, spreading the freshly fallen stems to the sun and wind to facilitate the drying process. From there, the raking and heaping of the hay filled out the rest of the morning. With this accomplished, after their midday dinner, the haymakers began bringing the hay in. And if, as on a good day, they finished all of this before 9 o’clock at night, they set back to mowing down another section in order to get a head start on the next morning’s labor. There were breaks during the day, some to sharpen scythes with whetstones, but mostly to visit the spring in the field, where a jug of hard cider was customarily kept. Farmers sometimes substituted rum and molasses for the hard cider, but this happened less so in later years as they came to realize that the rum tended to slow down the hired men during the long afternoons. By the time of World War I, the long labors of nineteenth century haymaking had been lessened considerably by the introduction of haymaking machinery. “A Departed Custom.” The Lowell Sun. 23 July 1918. 6. Hall, C.N. “Some Features of Old Connecticut Farming” The New England Magazine, An Illustrated Monthly: Vol. 22.